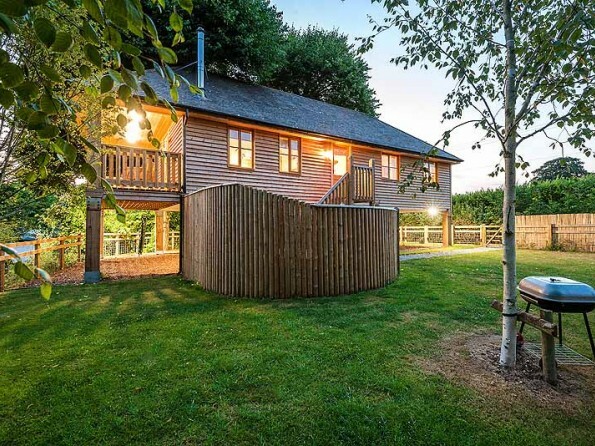 A magnificent, large and luxurious treehouse with private hot tub nestled in the boughs of two mature lime trees on a small farm in Somerset. 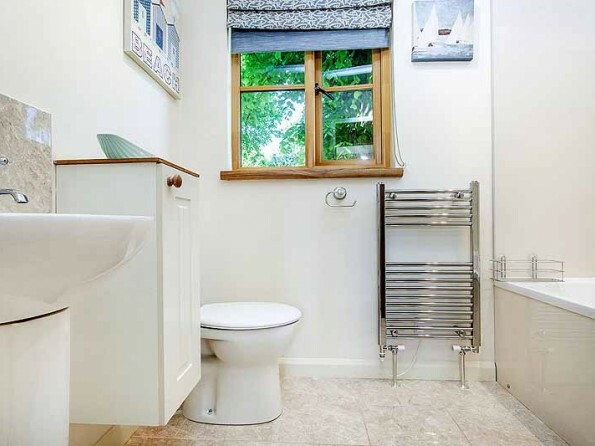 The farm is on the edge of a charming conservation village and includes use of an indoor heated swimming pool. 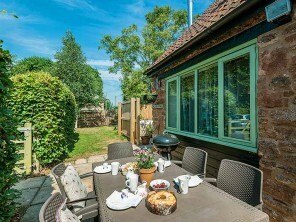 A superb place for a family holiday, both in terms of the unique accommodation, and the facilities and equipment provided for babies and children. 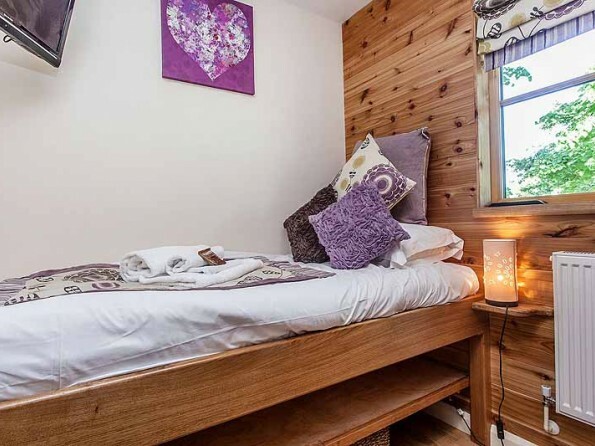 The owners will prepare the treehouse for your individual requirements, so let them know and they will provide all the bits and bobs you need, as well as toys, games, books and DVD’s. 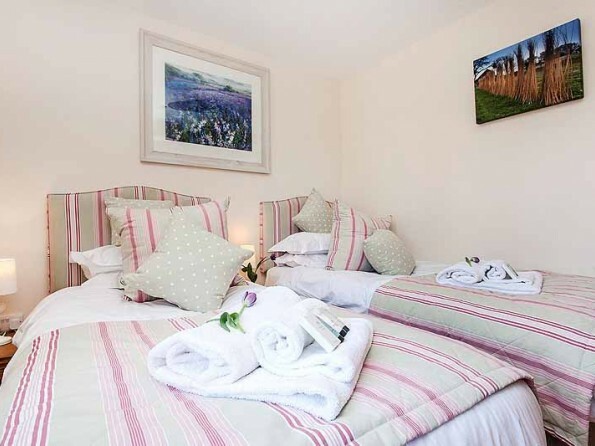 The Treehouse is always supplied with Egyptian cotton linen, fluffy towels, flowers, cosy bathrobes, toiletries and we leave a selection of local produce for you all to enjoy. 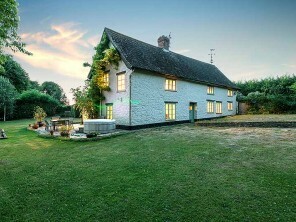 Four minutes walk to a great pub, 1.5 miles to the nearest shop, and the pool, grounds and children’s play area on site. Something for everyone! 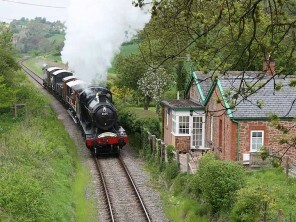 Somerset is a fantastic location for a treehouse holiday and it has heaps of attractions for people of all ages.With such easy access to the Quantock Hills, Exmoor and The Blackdown Hills, you can easily get out and about for some great walks, cycle rides, picnics and adventures. There are many pubs, restaurants and take-aways, enabling you to eat wherever and whatever you wish. Our local in the village of Halse is a fabulous pub (4 mins walk). There’s lots of information in the Treehouse, but some of the options include: West Somerset Railway, Bristol, Cheddar Gorge and Caves, Glastonbury, Quantock Hills, Hestercombe Gardens, Bath, National Trust properties, Exmoor, Exeter, Crealy Adventure Park, Oake Manor Golf Course, Tropiquaria, Taunton, Clarks Shopping Village, Riding, Clay Pigeon Shooting, Bike hire, Fishing, Racing, Quad Biking, Surfing....you name it! Detailed driving directions provided on booking. 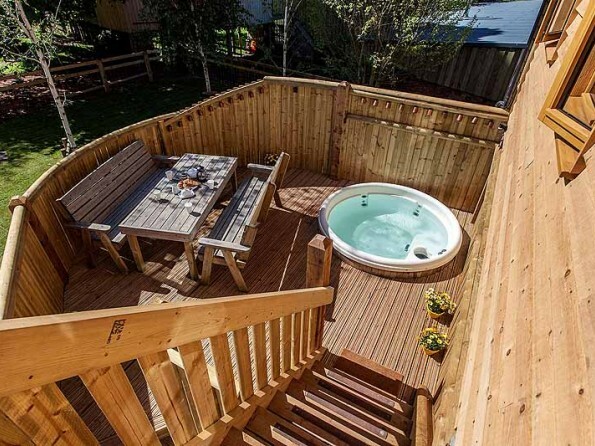 The treehouse has three bedrooms and two bathrooms. The master bedroom (ensuite) and the second bedroom are large and have zip link beds which can be made up either as superkings or twins. 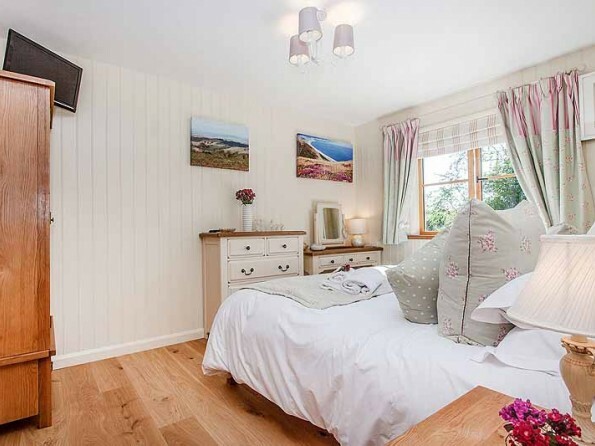 Each of these rooms has space for a travel cot or toddler ready bed. 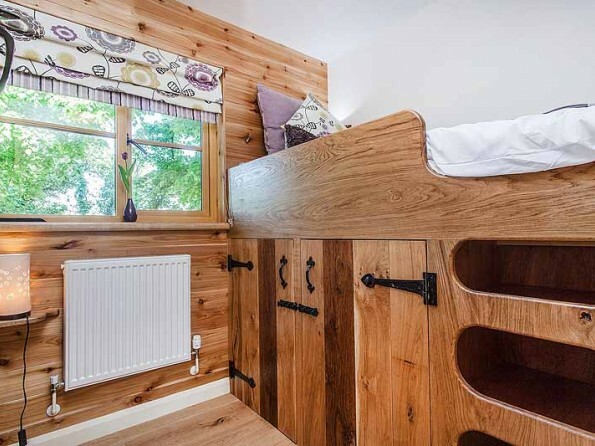 The third bedroom is a bunk room with full sized bunk beds. 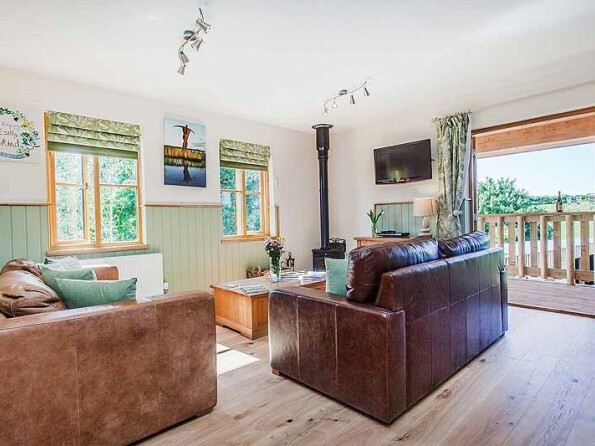 There is a large living area with underfloor heating, a woodburning stove, comfy leather sofas and plasma TV with sky freeview channels, ipod dock and digital radio. There is fibre broadband throughout. The dining area has an oak table and chairs and can comfortably seat six. 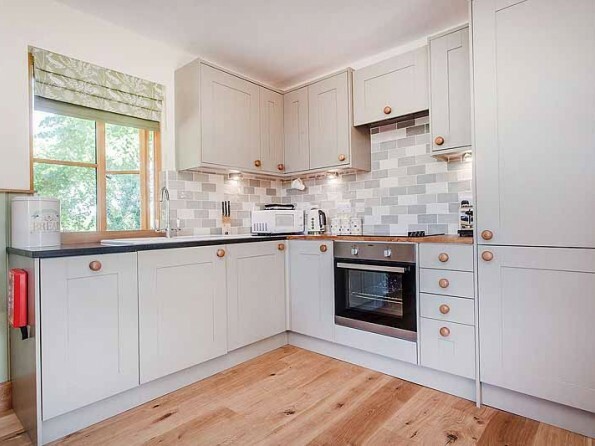 The kitchen has a beech worktop and Belfast sink, and has all the necessary appliances including dishwasher, washer dryer, fridge freezer, electric oven and halogen hob. 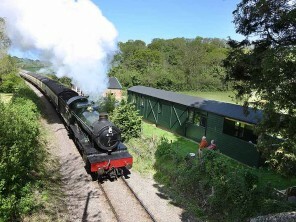 Set on a farm, there is a safe enclosed garden and a children`s play area, shared with the other accommodation on site. 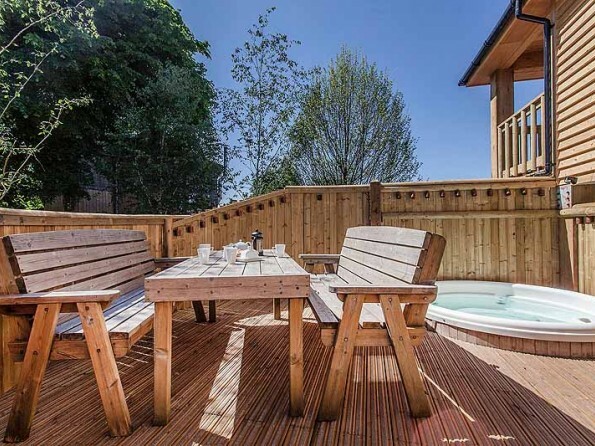 The treehouse has two decking areas, one of which is home to a private cedar hot tub (sunk into the decking) and both of which have seating and tables. 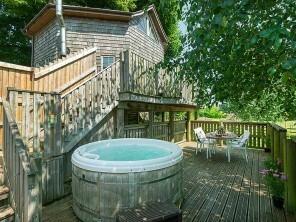 The Treehouse also has use of the shared indoor swimming pool every day from midday until 8.30pm. The pool is 38ft x 18ft and is heated to 30 degrees, so ideal for the youngest members of the party too! 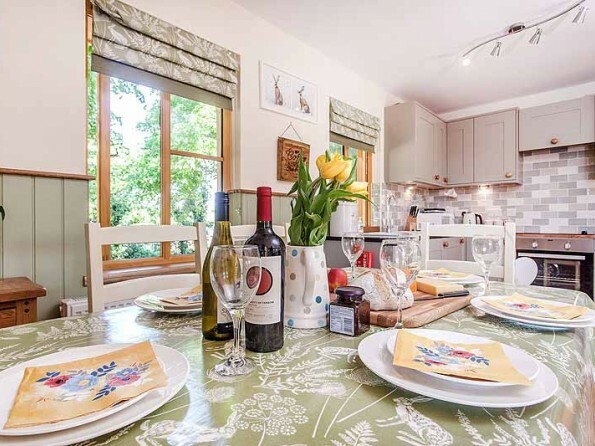 The Tree House is well equipped in all respects for family holidays! Satellite TV means that Cbeebies is never far away, and there is a collection of DVDs for all ages. We can provide age graded baskets of toys for the children as well as cards and games for children and grown ups! Stair gates are fitted, sockets have safety guards and there is plastic crockery and cutlery in the kitchen. We can let you borrow an enormous amount of baby and child accessories so please just let us know what you require. We have teamed up with Gayla at Select Catering and are pleased to be able to offer a fabulous menu of both ready-to-eat and ready-to-cook delicious meals. On receipt of the balance for your holiday, we send a copy of the Select Catering Menu. The amount and quality of local farm shops and opportunities for buying local food is staggering! For the ultimate in relaxation why not indulge in a spot of pampering! One of the South West`s premier spas, Cedar Falls, is just two miles away. Or My Personal Sanctuary will come and do pampering and treatments in the comfort of the house!